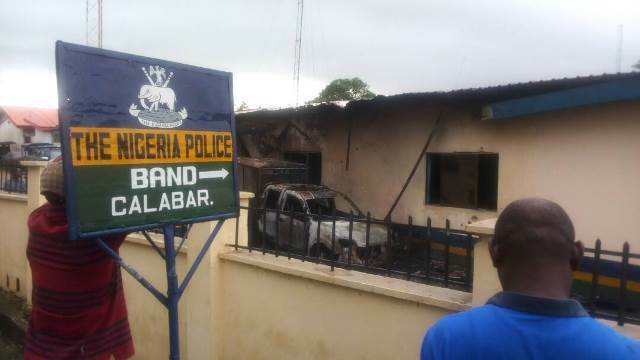 The Akim Police Station along IBB Way was torched following the clash the police had with men of the Nigerian Navy late Tuesday night. A misunderstanding between a policeman and a Naval rating along the traffic light along IBB Way by the UJ Esuene Stadium had snowballed into a clash between the two security agencies that saw men of the Navy storm the police station and rain hails of bullets on the structure. At least two policemen and a naval official were killed in the ensuing shootout it was gathered. Several others sustained gunshot wounds. The Navy and Police authorities were however mute on the exact number of fatalities on either side. It could not be immediately ascertained if any civilian was caught in the crossfire. In the process the police station was set ablaze, a police patrol vehicle and another vehicle inside the station were also burnt. It was gathered that the police in the pandemonium had to open the cells and free suspects in custody so they would not be killed in the fire. The walls of the police station that were still standing were riddled with bullet holes. The gun battle had engulfed most of the IBB Way from the police station to the UJ Esuene Stadium about half a kilometer away. According to residents, the gunfight lasted over three hours. Vehicles and other property of members of the public were damaged in the incident. The situation had led to a security council meeting between Governor ben Ayade and service Commanders in the state, after which the governor said they would ensure normalcy is returned. He regretted the incident and promised to take full responsibility for all the associated damages on both sides. Commander of the Nigerian Navy Ship, Victory in Calabar, Commodore Sid Jubril said also regretted the incident, saying they intervene promptly to check the escalation of the problem. He said that culprits in the incident would be properly investigated and appropriate sanctions meted on them. He said the incident in no way indicated that the police and Navy have a good relationship. Commissioner of Police. Mr. Inuwa Hafiz also said, “Yesterday’s fracas has nothing to do with the relationship between the Police and Navy. It was just a misunderstanding amongst our junior officers that led to the incident which we quickly stepped in to address. He assured that the matter will be thoroughly investigated and culprits brought to book.